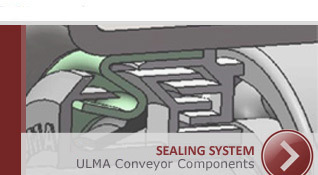 ULMA Conveyor Components offers offers a wide variety of rollers for the bulk and unit handling industry (mining, cement plants, power plants, quarries, etc.). Rollers are suitable for high speed and load conditions. In addition to the advantages of the Medium Duty rollers, the robust and yet lightweight design of these rollers, allow the conveyor to withstand very heavy loads. Rollers for standard working applications Nevertheless, the low friction force and the low Total indicated Turn Out (TIR) allows low energy consumption and reduce noise emission of the conveyor. In addition, the patented sealing system ensures long roller life time. Unit Handling rollers specially designed to conveyor isolated loads. 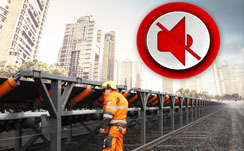 Acoustic contamination of conveyor belts near urban areas nowadays is a contamination parameter regulated in many parts of the world. The rollers produce part of the noise emitted by the conveyor, above all due to the dynamic interaction between belt and roller.